Primitive Americana Homespun Wrapped Spool Bundle Set of 3. 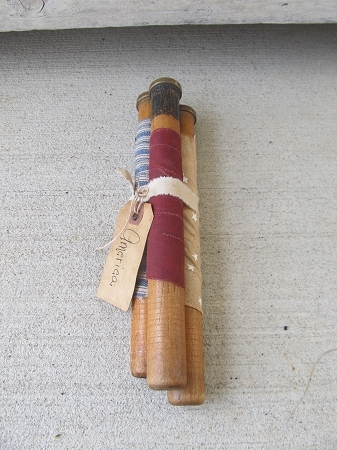 Country Americana spool bobbin bundle of 3. Lynn has made these for us. 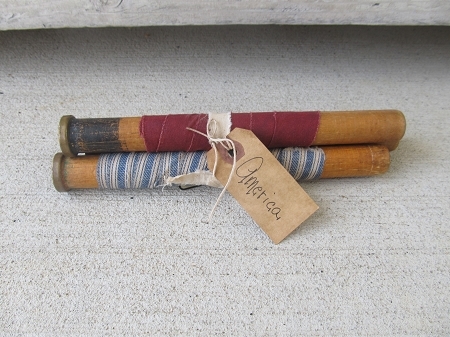 They are antique spool bobbins wrapped in Americana homespun fabrics, tied together with a primitive tag. One spool is wrapped in each color of Burgundy/Red, Navy Blue and a Warm Cream color. Size is 10" x 2" H.